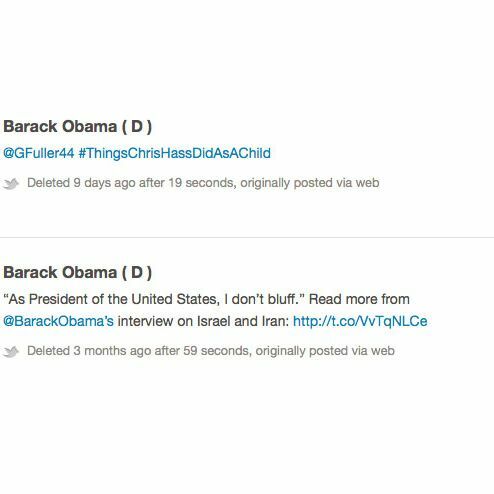 The Sunlight Foundation has scraped and compiled a list of all the tweets the Barack Obama Twitter account has deleted. There’s all kinds of shocking stuff here, not just one staffer accidentally sassing another from the wrong Twitter account. Like this one: “RT @alli_hanson Ending war in Iraq means that my son might grow up in a peacetime America. Thank you Mr. President. ” Can you believe they ever put that on the web? Or: “Add some #Obama2012 holiday cheer to your Christmas tree with our red and green ornaments: http://t.co/E4hybylM.” Waaaay too scandalous for Twitter.